With the F18 class already huge in Europe, it wasn’t until 2001when the first Tiger landed in the US. The Tiger was then selected for the 2002 US Multihull Championship (Alter Cup) in Syracuse, NY. After the Alter Cup event, the boats were eventually sold, seeding the northeast area and effectively kicking off the Tiger class in North America. Originally designated as a one design class by the ISAF and the Hobie Class Association it soon became apparent and too difficult to control the many changes of the evolving F18 class. F18’s conform to a box rule and are not a true one design class…allowing for design changes and innovations while maintaining strict control over materials and dimensions. The Tiger continued to be upgraded and win major events. Then in 2004 the Capricorn F18 was introduced…a game changer on which all current F18 designs are based. Although no longer in production at this time the Tiger is still very popular globally (approximately 2700 manufactured) and is up for consideration as the multihull for the 2016 Olympics along with the Hobie 16. Tigers continue to be raced competitively to this day at HCANA and North American F18 events with its most recent win at the 2010 Canadian F18 National Championship. The International F18 rules state that boats must weigh a minimum 180 kg (396 lbs) full up. Typically Tigers were coming from the factory between 180 kg (396 lbs) and 184 kg (405 lbs). Some boats were lighter requiring corrector weights as necessary to bring the boat up to the minimum weight. Boat corrector weights are affixed to the port side and any crew corrector weights (see Crew Weight) are attached to starboard…both usually on the dolphin striker. The crew corrector weights must be visible and removable. This is the beauty of the Formula 18 class. F18’s use a graduated weight scale and sail plan size depending on crew weight. This levels the competitive playing field and helps equalize boat performance – relying more on the crew’s sailing ability and boat handling skills. The crew consists of 2 persons with the minimum combined crew weight being 115 kg (253 lbs). The crew shall use the sail plans (as defined in the International F18 rules paragraph G.2.3) in accordance with the following weight categories: (1) Crew between 115 kg (253 lbs) and 130 kg (286 lbs) shall sail with the small jib and small spinnaker and then shall carry extra weight equal to half the difference between their actual weight and 130 kg (286 lbs). (2) Crew between 130 kg (286 lbs) and 140 kg (308 lbs) shall sail with the small jib and the small spinnaker and shall not carry extra weight. (3) Crew in between 140 kg (308 lbs) and 150 kg (330 lbs) may use the large jib and the large spinnaker and then shall carry extra weight equal to half the difference between their actual weight and 150 kg (330 lbs). (4) Crew weighing 150 kg (330 lbs) and over may use the large jib and the large spinnaker without carrying any extra weight. The F18 class utilizes two different size sail plans depending on the weight scale above. Small sail plan dimensions:	Jib – 3.45 m2 Main – 17 m2	Spinnaker – 19 m2 Large sail plan dimensions: Jib – 4.15 m2 Main – 17 m2 Spinnaker – 21 m2 Typically the all-round optimum Tiger crew weight is 340 to 360 lbs and uses the large sails. The Tiger was designed with breeze in mind. Upwind performance is smooth and confident. Be prepared for lots of double trap time and keeping the boat in a balanced trim. In light conditions crew weight should be forward to the front crossbar and split…crew on the low side and skipper on the high. This is to help keep those buoyant bows in the water and helps raise the sterns. As the wind speed increases the crew moves to the high side and onto the trapeze when needed. Double trapping usually starts in winds above 9 mph. Playing the mast rotation and downhaul will keep the boat flat and powered up when going to weather in breeze. The downwind crew positions are similar to upwind…forward and split in light conditions, high side and aft as the wind builds. As the wind increases the skipper should keep the boat in “wild thing” (flying the hull downwind) mode. This is a balancing act dependent on crew position and a very fast way to sail downwind. As the wind continues to increase…the crew will transition to the high side and eventually to the trapeze with both skipper and crew moving aft. Downwind the Tiger is more forgiving because of the increased buoyancy in the bow and the lift provided by the spinnaker. You can push it harder downwind without fear of pitchpoling, turning downwind for control and stability. This is counterintuitive to a non-spin boat where you would turn upwind to lower the hull. Turn upwind with a spin up and you will go swimming. But downwind is where the boat struggles against the newer planning hull designs. The Tiger does not plane and is not as fast as the Wildcat downwind in a blow. But the gentle rocker of the symmetrical hulls makes for easier going in rough conditions. Steering has a bit of a “heavy” feel to it compared to the Wildcat. Upwind both the Tiger and Wildcat have comparable speed. In light conditions the boats are fairly equal both upwind and downwind. The mast is stout (tear drop section vs. the Wildcat’s wing section) and is not prone to excessive bending (twist off at the top) when the spin is up in breeze. This is where having the 10:1 main sheet system is really nice. There have been many changes/upgrades to the Tiger over its lifetime. This was done to keep the Tiger competitive with the latest developments within the F18 class. 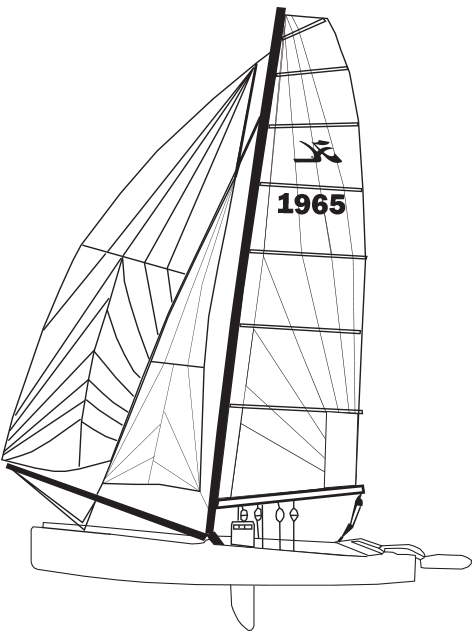 At its inception the Tiger had pinhead mainsail, 8:1 main sheet system, roller furling jib, manual jib cleats on the front crossbar (like the Hobie 16) and a tramp launched spinnaker bag set up. The original trampoline design was attached to the hull and exited from the bottom of the front crossbar. The boom was a rectangular tube borrowed from the Hobie 20. Then came the first wave of changes…self tacking jib, square top mainsail (ST), round tube booms and early versions of spinnaker snuffers both bag/sock type and hard trumpets. The second wave of changes included carbon foils, bigger square top main (STX), fully battened jibs, suspension tramps (detached from the hull) exiting from the top of the front crossbar, flatter cut spinnakers and spin block relocation on the hull deck. The third wave consisted of redesigned rudders and increasing the stand-off of the gudgeons, 10:1 mainsheet system, Pentax jibs (formally Dacron), removal of the roller furling system to a one piece forestay, refined bag/ring snuffer systems, the addition of sissy blocks and lowering the bridle tangs from the hull deck rail to mid-hull. During all these changes and upgrades, the hull design, crossbars and mast remained the same. Although the Tiger was race ready out of the box, several go fast and convenience modifications are recommended. Older Tigers have a glue seam overlap that caused a ½” wide ridge to run the entire length of the keel. Racers filed this ridge off and then applied gelcoat. Later year production boats had this removed at the factory. The spinnaker blocks on the hulls were moved forward from behind the daggerboard well to just in front. This is an easy upgrade and is necessary for properly trimming the newer, flat cut spinnakers. “Sissy” blocks should be added to the front crossbar to aid in spinnaker sheet purchase. Originally there was only one set of spin blocks (on the hull mentioned earlier) which made flying the spin very fatiguing for the crew. The spinnaker sheet does not have any cleats and is hand held. If your Tiger does not have a self tacking jib, install one. Set it and forget it. Retrofit kits are still available from Hobie Cat. Another upgrade is to install one of the soft bag/ring type spinnaker snuffers. There are several that are commercially available. Two recommended snuffers would be the current Hobie Wildcat snuffer or SNU (Spinnaker Nesting Unit) from Barefoot Studios. If you have rudder or daggerboard hum, file down the trailing edges until quiet. Move the trapeze wire bungie cord outboard from the tramp grommets. Skippers trapeze is off of the shroud anchor and crews trapeze is inside the front crossbar like the Hobie 20 set up. This helps keep the tramp free of clutter. The Tiger is a very robust sailing platform. However there are a few things to consider that will extend the competitive life of the boat. Trailer cradles are an absolute must to spread the load bearing weight across a large section of hull. Rollers will only dent and damage the hulls – DO NOT USE. Beach wheels are another necessity for launching and retrieving. Roll your boat directly into and out of the water…NEVER drag your boat across the sand. This will prolong the bottom contour of the hulls. Be sure to use the same trailer cradles on your beach wheels…not just padding over the axel. That will leave dents in your hulls. Once on the sand/grass/parking lot and still on the beach wheels, use stern protectors to keep the entire boat off the ground. Several styles are available – both commercially and homemade. Roll, never fold, your jib and main. Flake your spinnaker for storage. These actions will help prolong the life expectancy of your equipment. There are many good used Tigers now on the secondary market. Look at the general condition of the hulls…are there any cracks at the crossbar saddles, in the glue seams, rigging tangs or daggerboard wells? Check for soft spots on the decks or any repaired areas. Inspect the foils…are they chipped or dinged? Look at the sails…are the main and jib rolled? Look for any rips/tears or repaired areas. Spinnakers take a lot of abuse with hoisting and dousing. Check for rips/tears/holes and the crispness of the material. It should not feel like limp tissue paper. It’s probably best to get a new spin if you’re going to race. Check all the rigging to be sure there are no broken strands or kinks. These are weak points which will fail eventually. Was the boat used exclusively in salt water? If so…check for any general corrosion. Used boats generally range from $4000 to $9500 with the boats in best condition commanding the higher prices.